In service inspection (ISI) of aged power plant parts has a delicate task to provide information on presence, position, orientation and size of defects in material. As far as results of ISI are just a starting point for elaborate procedure of life assessment or risk analyses, the accuracy and reliability of these results are particularly important. Time of Flight Diffraction (TOFD) technique is regarded as one of ultrasonic techniques capable to fulfil required precision, being approved in nowadays routine inspection of retaining rings or LP turbine rotor discs. Apart from these, usually highly automated inspections, a manual TOFD testing designed for particular plant component reveals reliable and useful defect information as well. In this work, results of TOFD inspection of turbine inlet casing are presented. The component was inspected subsequently during several years up to the point of substitution by a new one. Gained TOFD results are compared with results of visual and metallographic examination of samples cut out from the casing. Maintaining of aged power plants is very common problem in Slovenia, since many plants are older than 30 years. Structural integrity assessment of components of these plants is difficult due to the fact that past operational conditions are only partly known and material analysis provides usually incomplete data, due to impossibility of taking proper samples of material. Consequently, non-destructive methods of ISI are the ones maintaining engineers rely on. 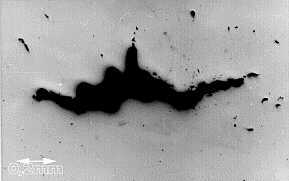 NDT methods with appropriate reproducibility provide us a possibility to evaluate a crack propagation (Ryder, Roberts and Wiswanathan ). In this paper, examination and testing of 28MW turbine inlet casing is described. The casing had been produced in 1962 and had accumulated nearly 180 000 working hours and many start stop cycles. It was designed as a pressure vessel and had a thick-wall section that is more prone to thermal fatigue. It has 6 steam outlets, leading to steam governor valves, every outlet surrounded by 8 bolt-holes (Fig.1). Due to geometry of the component and stress-strain conditions, the most interesting are the pairs of bolt-holes between outlets. Castings frequently contain some characteristic defects such as: shrinkage cavities, incompletely healed hot cracks and fabrication welding. They could initiate crack growth, especially if they are located at sharp grooves or highly stressed areas. That was the reason why, in performing the inspection, particular attention was paid to highly stressed areas, because long term past experience showed that tolerable manufacturing defects do not grow when located in low stressed areas. Inspected casing was manufactured from G21CrMoV511 alloy, heat treated in such a way as to increase strength at the expense of ductility. Since steel-making processes in the past were not as refined as nowadays, this steel contains a much larger amount of impurities and inclusions than modern steels. So, because the casing might have contained crack-like manufacturing defects, as well as the creep and low cycle fatigue cracks from service, the problem was how to resolve these two kinds of defect, and consequently how to treat them in performing the integrity assessment procedure. During non-destructive inspection of the surface of the inlet casing, which was performed by an ultrasonic method (pulse echo), many disturbing signals were found. The area between bolt-holes, between main entrances was examined as shown on Fig.2. Regular 2MHz and 4MHz 45° probes were used, revealing strong signal with two or more peaks which faded down above 20mm and below 40mm (approx.). One possible interpretation was the presence of a large branched crack, which stretched between two bolt-holes. However, the echodynamics of signals differed significantly from place to place and signals were too dense to be interpreted or located. Furthermore, it was confusing that similar signals were observed between several pairs of bolt-holes, but it could be hardly expected that several big cracks exist between bolt-holes. The idea was to collect the crack size data, by performing repeated inspection by the ultrasonic TOFD method over a certain period, hoping that the reproducibility and accuracy of the method would be good enough to show the crack propagation. That would lead to an estimate of the flaw growth rate during service. TOFD examination of the inlet casing upper plate was performed manually, due to geometry and space available on the object. Results were collected in three consecutive years: 1997, 1998 and 1999. 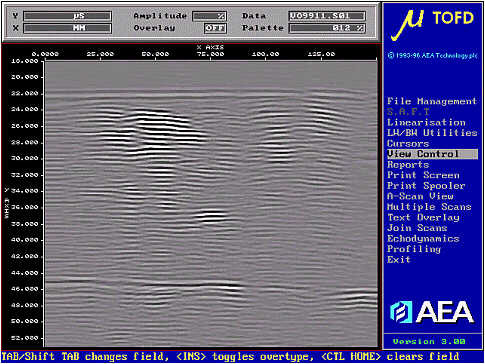 Examination variables were the same except for one detail: in the year 1999 scanning was performed in the free run mode, i.e. without encoder, since this failed immediately before the examination. Regarding other parameters, they are as follows: gain 40 dB, two 2 MHz probes of 45° and of diameter 12mm were used, with probe centre separation 50mm. According to the calculated beam coverage, the middle section of the inspected volume; i.e. the depth between 10 and 50mm, has the best beam coverage. This area is of particular interest since the bolt-hole threads reach 55 mm in depth. Scanning was performed as indicated in Fig.2, covering the surface between bolt-holes but not the area around each of them. The thickness of scanned plate was 95mm. B scans were obtained for every pass between main outlets 1-2, 2-3, 3-4, 4-5 and 5-6. In this paper, B scans for pass 4-5 are commented, since they are typical for this casing. The TOFD inspection in 1997 had three aims: to confirm or deny the presence of a large crack connecting two bolt holes, to locate and size the defects present and possibly to resolve the manufactured from the service-caused defects. Immediately after the scanning was completed, it became obvious that examination could not fulfil two tasks: defect indications were too dense to be distinguished from each other, which caused doubtful characterisation and sizing. It became evident that there was no large crack, however many defects existed in the volume between bolt-holes. The resolution of the indications was not improved with use of the Synthetic Aperture Focusing Technique (SAFT) process. The indications cannot be separated from each other, nor can the phases of probable upper and lower crack tips be reliably recognised (Fig.3). Two groups of signals on the B scan are of particular interest, since they correspond to two pairs of bolt-holes between outlets 4 and 5. In order to distinguish them and to refer to them more easily, the two groups of defects were named "(Group A)" and "(Group B)". Instead of monitoring upper and lower tip of a single crack, we monitored location and depth of upper and lower tips of "(group A)" and "(group B)" defects. Results are given in Table 1. Other single indications, coming probably from shrinkage cavities, are not so significant. When comparing three consecutive scans of the "group A", it can be seen that indications of defects emerge every year more deeply. Significant increase in intensity of some signals can be seen. That might indicate planar progression in a direction parallel to the surface, i.e. the interconnecting of adjacent defects. Regarding the "group B", propagation of defects during three years occurs in both directions - toward the surface and in depth. Some obscuration of signals located below the upper tips signals on Fig.3 can be seen; this indicates the presence of a progressing crack connecting present impurities. The low intensity of the upper tips signals on Fig.3 is associated with their position beyond optimal beam coverage. The results of metallographic analysis showed no evidence of creep. In the bulk of the material many shrinkage crack-like defects have been found, like the one given in Fig. 4. 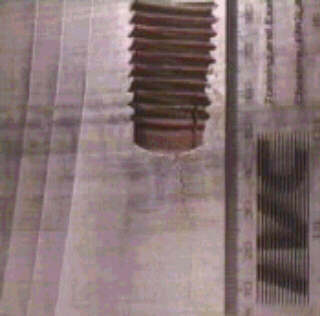 In autumn 1999 the inlet casing was finally replaced, what gave us unique opportunity to prove TOFD findings by looking at the cross section of examined surface. The casing has been cut between 4th and 5th main steam outlet near bolt-holes. Severe crack, starting from the bottom of one bolt-hole grows in the depth of material (Fig.5). The crack shows no signs to spread toward nearest neighbouring bolt-hole, what proves first TOFD results dating back to 1997, which results eliminated existence of planar discontinuity. Fig 5: Crack below the bolt hole. Further TOFD examination was performed on the cracked half of inlet casing surface in order to test the sizing and resolving capabilities of a system on known defect. The crack is located below bolt-hole threads; so it is not easy to design the appropriate probe position or path. There is partial lack of lateral signal when the probes bridge the bolt-hole, what makes sizing more difficult. Furthermore, it is hard to assure the reproducibility of examination, since several directions of scanning are possible. Since the geometry of the sample directed the examination, a short D scan was performed. Clear appearance of crack tip was expected, but results were disappointing. No clear crack tip can be seen; scan is showing some indications whose origin may be anywhere on ellipsoidal path defined by probe positions according to Charlesworth and Temple . The intensity of signals is low because the bolt-hole intersects the incident beam. On the other hand, a number of defects and overlapping of their phases disable characterisation and sizing. Turbine inlet casing produced in 1962 has been examined. Due to many parameters missing, the complete procedures for integrity assessment of the component could not be applied. The only usable method of evaluating of degradation process was to compare subsequent results of reproducible non-destructive testing, using TOFD techniques. the propagation of defects can be monitored. overlaping of signals, caused by dense shrinkage cavities, possibly present in castings, disables accurate sizing. Despite some problems regarding design of scanning and difficult characterisation of overlaping indications, advantages of TOFD make it the useful tool in in-service inspection of castings.